From a very early age I always told people that one day I’d write a book. I had no idea what about but I was going to publish a book. My photography gave me a story so about three years ago I thought why not, let’s give it a go. Now I’m not a fan of Amazon but they do offer anyone the chance to become a published author so my book was until recently available to download and be read via the Kindle App. That all changed just before Christmas when I got an e-mail asking my why don’t I publish my book in paperback!! So why not, it was only ever I suppose a vanity project. I never expected anyone to actually buy it. But they did, and all the money raised from the sales have gone to my local nature reserve. So I set about producing my book as a paperback. However it isn’t just a case of sending off the same files and hey presto a book appears. I spent two quite frustrating days re-sizing all the images to a higher DPI which then meant the pagination was all over the shop. I then had to design a cover and set a price. The cheapest I could sell it at was £12.99 and from that I would make the princely sum of £0.25!! Vanity can be so unrewarding. I finally bodged it together and Amazon accepted my upload and told me my book would be able to purchase in 48 hours!! It was actually available on their site within 24 hours so I bought one using my prime account and it arrived the next day. What a totally mind blowing experience from upload to my doorstep in less than 2 days! I bought another copy for my mum for Christmas (she was absolutely amazed) which she has been lending to all the neighbours! She just laughs when I tell her to get them to buy a copy! And to be honest I thought that would be that for the paperback. But I just checked my Amazon account and its sold a few copies as has the Kindle version, so it’s time to work on the sequel. A Year Looking for Otters anyone? A Year Looking for Kingfishers is available by clicking here. Ever tried Sticky Toffee Pudding? Well if you have you have my wife’s Uncle to thank. Francis Coulson is my wife’s Uncle and despite the many claims and counter-claims, the original Sticky Toffee Pudding recipe was created by Francis Coulson at Sharrow Bay in the 1970s, and it is said that the featherlight sweet figgy sponge drenched in toffee sauce is ‘still the finest you will find anywhere in the world’. Francis Coulson’s original, secret recipe is the stuff of culinary legend, anecdotally inspired by Brian Sack’s time as an RAF Spitfire pilot, where he saw Canadian RAF Pilots use Maple Syrup. This was pre Food Air Miles, so necessity became the mother of invention! Staff at Sharrow Bay have signed a secrecy agreement to not disclose the secret recipe that is held in the hotel’s vaults, nor must ex-staff ever use the recipe at any other business. I only met Francis once and he was an extremely nice man but unfortunately he never told us the recipe! Just think if we had a £1 for every toffee pudding ever eaten I’d be writing this from a beach somewhere!! In 2007, an anonymous bidder paid £32,000 to the Children in Need charity in order to stay at Sharrow Bay and be allowed to make the pudding alongside the pastry chef. C’est la vie as the French would say, life wouldn’t be any fun if it was easy. So next time you fancy a really sweet delicious pudding grab yourself a sticky toffee one and quietly thank Uncle Francis for creating this superbly sweet treat. And don’t worry I really don’t want to live on an idyllic beach honest!!!! I recently published a book and a couple of the wonderful people who read my nonsense and like my pictures bought a copy. So thank you very much! One blogger went beyond the call of duty though and not only bought my book and read it she even offered to correct some of the silly schoolboy errors I’d made. So this is a big thank you to Annette and if you don’t already follow her Why Not! Her blog is My Aberdeen Garden so please have a look, I’m sure she’ll appreciate you dropping in and if you have a book that needs editing I’d highly recommend her. This pic is just for Annette so no peaking! As you know I’m not much of an art buff but its been Half Term here last week so I took a day off so we could have a day out. 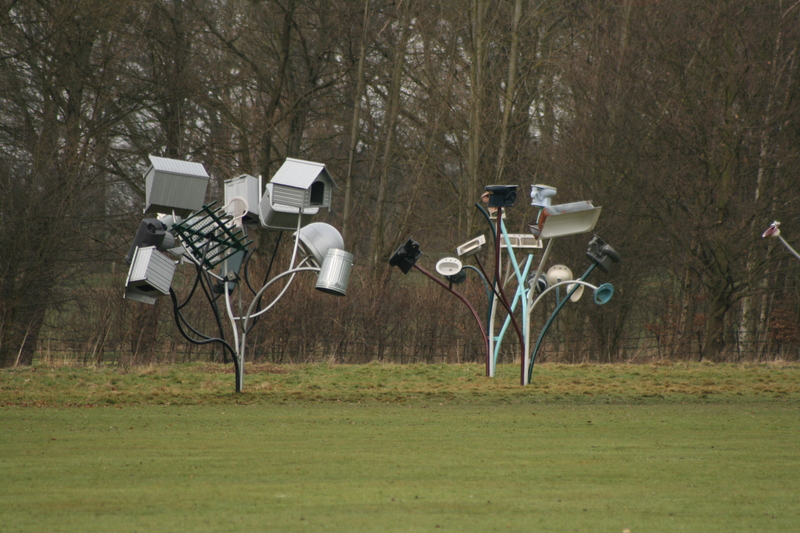 The Yorkshire Sculpture park is one of those places that’s on your door step but you never get round to visiting so off we finally went. 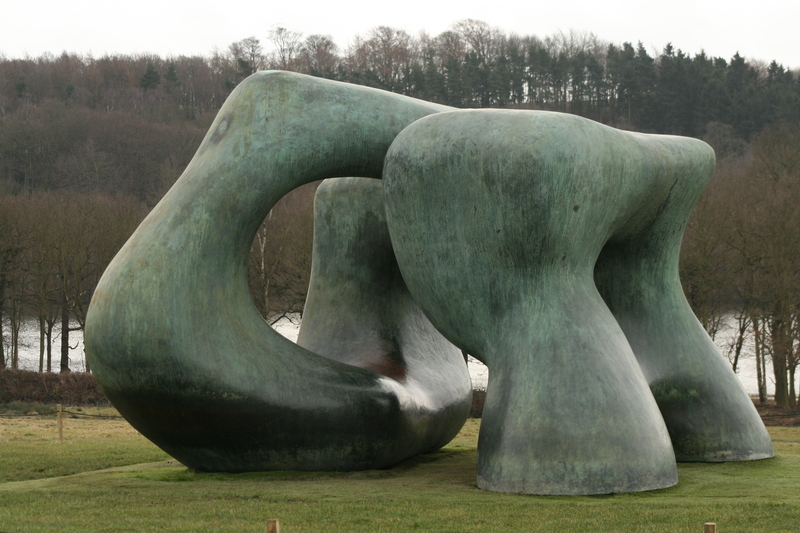 The park is is an open-air gallery showing work by British and international artists, including Henry Moore and Barbara Hepworth. 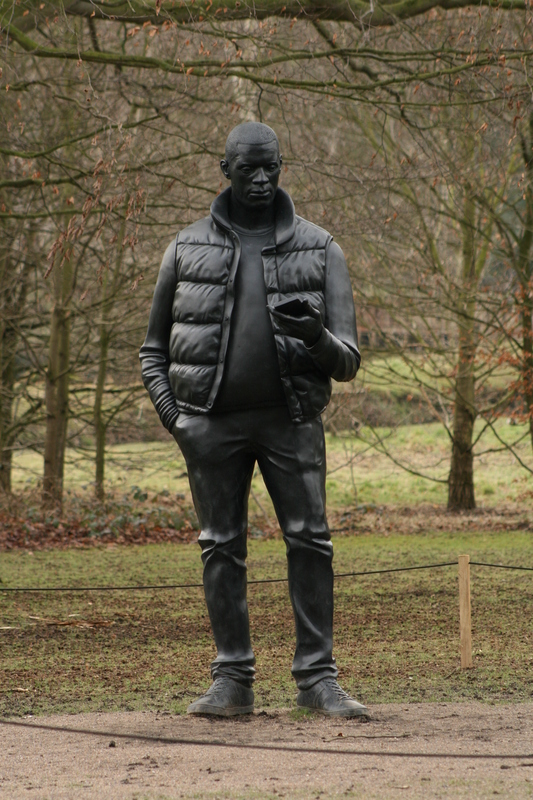 The park’s collection of works by Moore is one of the largest open-air displays of his bronzes in Europe. There is plenty of works to see but the majority are piles of bricks or collections of metal along side pretentious descriptions of what the artist believes they represent. Personally I don’t get it but if that’s what you like then its fine by me. There were a couple we liked but the majority left me scratching my head. Well seen as WordPress have done all the work in reviewing my year I might as well publish it. If you’re mentioned Thank You and can someone from a new country visit so I can hit 50 visiting countries???? We’re getting close to the end of the tour now with just a few more to go. This was an early purchase for the collection and again was bought from the London Gallery Art You Grew Up With. I was going to steal this picture and I’m sure I would have got away with it if it hadn’t been for those pesky kids !!!!! 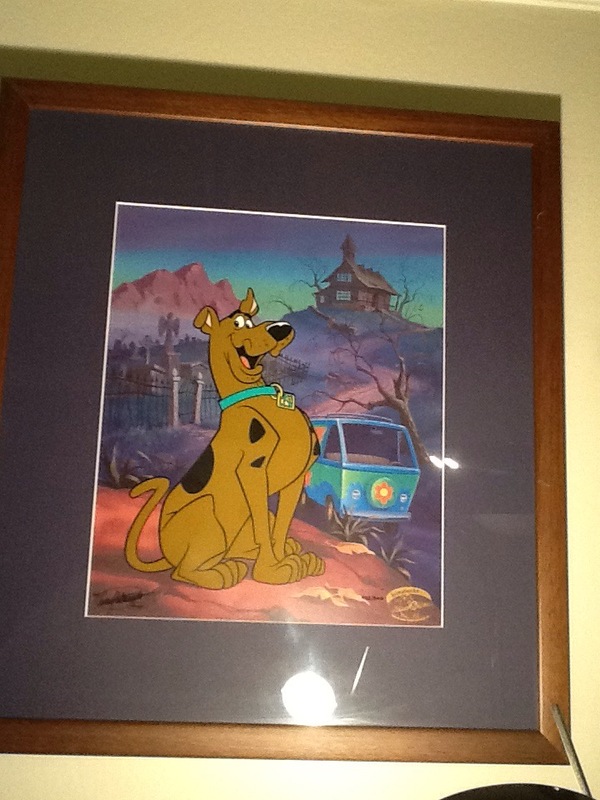 Scooby Doo is currently on display in the living room. 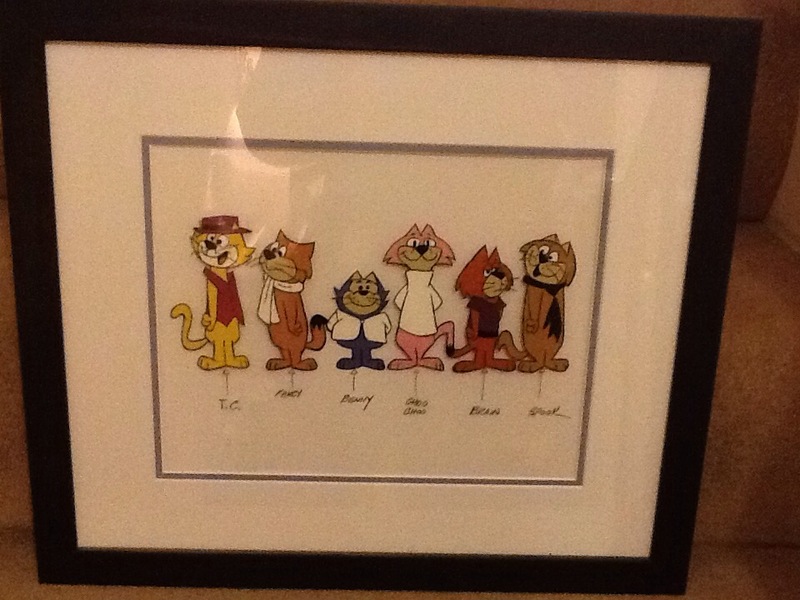 This is definitely one of my favourites, Top Cat and his crew. Based on the Bilko TV series, Top Cat was an alley cat who always had a money making scheme on the go. Constantly outfoxing the local policeman Officer Dibble TC lived in a garbage can with built in TV and used the police phone to set up his deals. 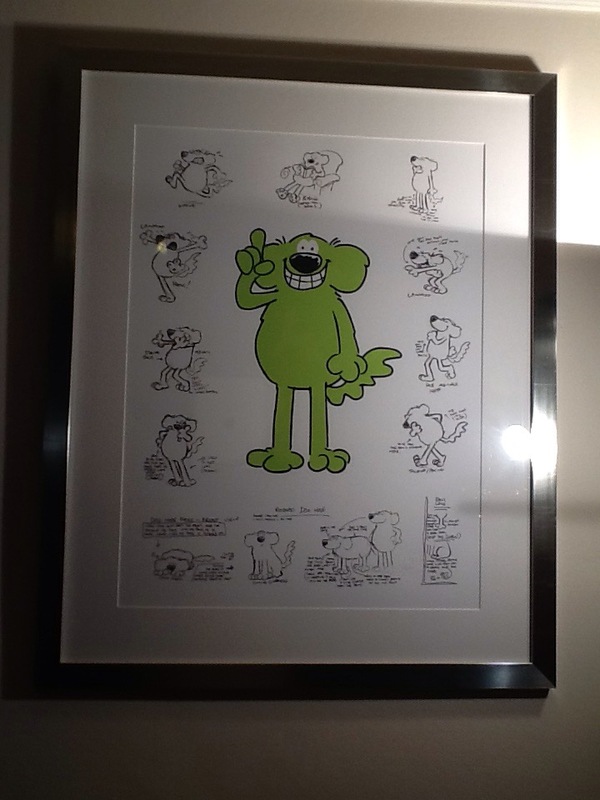 This picture features the whole gang and is currently on display on the stairs. After finishing for the Christmas break early today I took Jake to see the final instalment of The Hobbit. I love going to the cinema I just begrudge handing over almost £30 for the privilege. As Smaug takes his vengeance on the town the fire alarm in the cinema went off! The film stopped and the lights came on and we headed for the door. Just as we got to the exit of our cinema the all clear was given and a couple of minutes later the film resumed. We settled back down finished the popcorn, drank the bucket of coke and enjoyed the movie. As we left we were given a free ticket for our next trip to the movies so I won’t begrudge my next visit. As to the movie? It’s ok but probably a trilogy is stretching quite a short kids book a film too far. 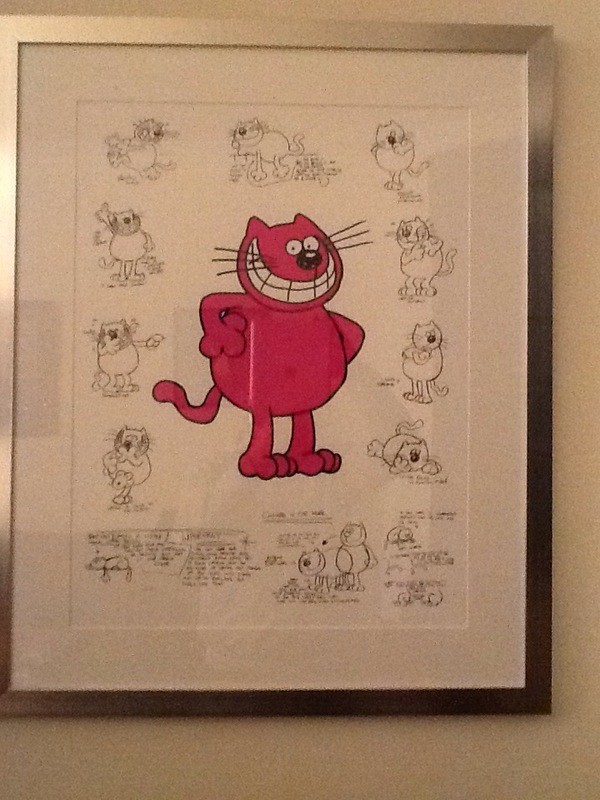 For anyone growing up in the UK through the 70’s then Roobarb would have been a feature of every late afternoon. A short five minute cartoon in a very wibbly wobbly style featuring a green dog called Roobarb and his sarcastic pink cat neighbour Custard. Roobarb was an inventor and an adventurer who built moon rockets and submarines watched by a flock of twitchy birds whilst Custard mocked from the garden fence. It was voiced by comic actor Richard Briers and its thick marker pen style made it cult viewing over the years. Currently on display in the living room.